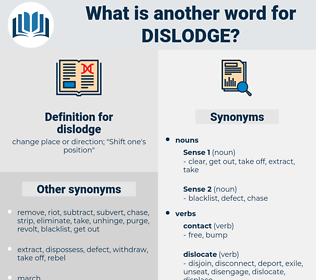 What is another word for dislodge? change place or direction; " Shift one's position"
displace, expel, remove, vacate, deport, eject, drive, scroll. order, take in, sow, plant. Part of it was smooth rock, but long banks of gravel lay resting in the hollows at so steep a slope that it was evident that a footstep would be sufficient to dislodge them. For the life of you don't dislodge any stones. deckle edge, disk clutch, decolletage, declutch. 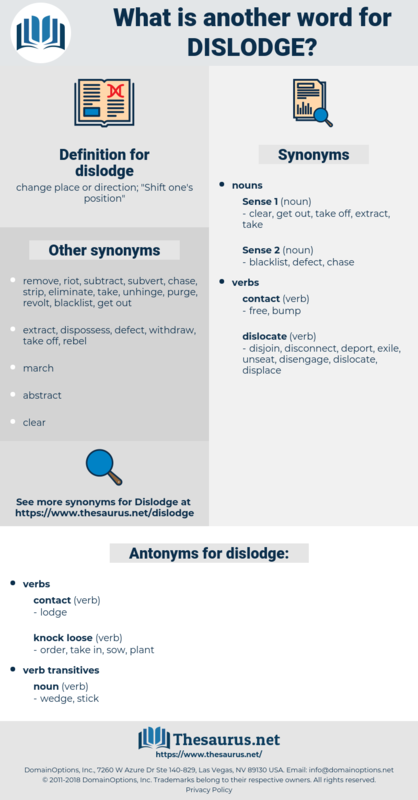 displace, take, take away, remove, withdraw.